When you have heart problems, figuring out your diet can be downright exhausting. It’s hard to know which foods will help support your ticker, and which ones could cause harm. And then there are those hidden heart hazards. The foods that LOOK like they’re heart-friendly, but aren’t. Following are four foods you might be surprised to find out are some of the worst foods to eat if you have heart problems. Lean proteins are part of a healthy, heart-friendly diet. And tasty turkey should have a prime spot on that list. So why is it on our worst foods list? Simple. There’s a big difference between organic, farm-fresh, pasture-raised turkey and lunch meat. The latter is highly processed, shot full of chemicals, formed, pressed and ultimately turned into a sliceable loaf of meat. Plus the nitrates and junk sodium used to keep lunch meat from spoiling faster than your grocery store can sell it have turned what should be a dietary staple into a nutritional no-no. Order a pasture raised turkey breast from your butcher and bake or broil it yourself instead. That way you will get all the delicious flavor and health benefits you were expecting and deserve without any of the heart harming additives. Sure, applesauce sounds like a nutritious and heart-healthy snack. And it can be, if you’re eating the right kind. Unfortunately, most folks aren’t. The vast majority of commercial brands of apple sauce are little more than apple flavored candy. They start strong with apples, of course. But then they remove the skin, tossing all that good-for-your-heart soluble fiber into the trash. Next, they dump sugar into the mix, often in the form of sickening high fructose corn syrup. In fact, HFCS is the second ingredient in some of the top brands. And that’s terrible news for anyone with heart problems because added sugars increase your risk for dying from heart disease. Don’t worry, if you’re an applesauce fan you CAN still eat this tasty treat. After all, apples are packed full of flavonoids and phytonutrients which are terrific for your heart. Just commit to making your own applesauce using organic apples WITH the skin on and no added sugars. It’s easy to make your own. Just boil cored and chopped apples for about 20 minutes stirring frequently. Then mash, blend or food process them to your desired consistency. Add some fresh lemon juice and cinnamon to taste if you like, and dig in. If you’ve switched from whole milk or real cream to non-dairy coffee creamer because you thought it was better for your heart I have some bad news. Not only are you not doing your heart any favors you could even be contributing to your heart problems. First, there isn’t any significant evidence that a moderate amount of fat in your diet contributes to heart disease. In fact, in some cases research on healthy folks has found the opposite to be true. Very low fat high carb diets may contribute to heart disease while high fat low carb diets can lower blood pressure and improve triglycerides. But that’s not the only reason the switch to the fake stuff is a bad idea. Most non-dairy creamers contain a dirty little secret. Although these days they claim to be trans-fat free, many of them aren’t. They’re using a loophole to make the claim. Because as long as there is less than .5 grams of trans-fat per serving, companies don’t have to list it on the nutritional label. Skip the nutrition box and check the ingredient’s list instead. Look for the words “hydrogenated oil.” If you spot it it’s a dead giveaway your non-dairy creamer still has heart harming trans-fats in it. And when you add a real person’s serving to your coffee—two tablespoons—by the time you reach the bottom of your third cup you’re gulping down 2.4 grams of trans-fat a day. When it comes to peanut butter, it’s all about the brand you choose. Because just like with applesauce, most of the major manufacturers take a heart-friendly food and transform it into a nutritional nightmare. A Harvard study found affordable peanuts have the same heart protecting powers as two other heart-friendly nuts… walnuts and almonds. And numerous studies have found folks who eat peanuts or peanut butter are less likely to develop heart problems in the first place. 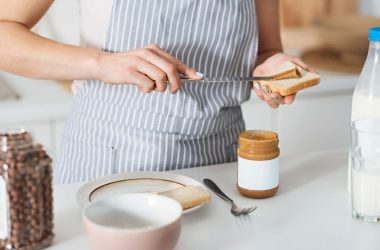 But most commercial brands of peanut butter include hydrogenated or partially hydrogenated oils which means with each bite you’re also getting some trans-fats. And to make matters worse many are loaded with dangerous added sugars too. The good news is there are brands that don’t add either. You just need to carefully read labels and choose one that contains only peanuts with no added sugars or hydrogenated oils. When you have heart problems, it can be tough to figure out what foods are good for your ticker and which ones you’re better off avoiding. You can go ahead and scratch these four off your list.